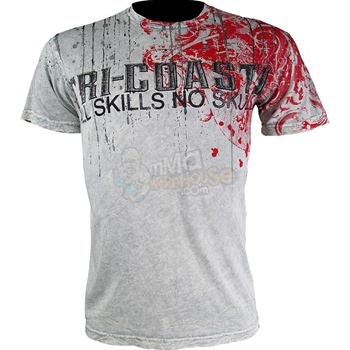 Tri Coasta is making a huge statement with this limited edition shirt.Made with 100% 30/single ringspun cotton, this athletic fit shirt features a double needle cover stitching around sleeve openings and bottom hem, features shoulder to shoulder taping and is also pre-shrunk so avoid.. well, shrinking. MMAGearGuide.net Verdict: it’s a pretty damn good looking t-shirt and it really does speak for itself. If you want a brand that doesn’t scream out the negative connotations that some other MMA-related shirt designs would do, then by all means, buy this shirt. After all, there are only 100 of these made.